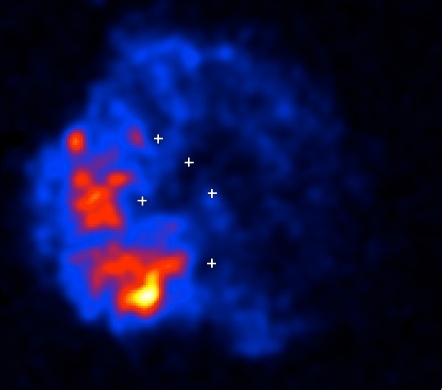 The remnant G349.7+0.2 seen in X-rays with Chandra (Lacendic et al. 2000). 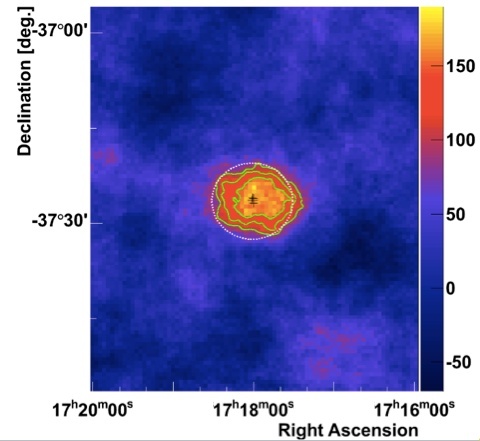 The crosses show locations of OH maser emission, indicative of interaction of the expanding remnant with a molecular cloud (see also SOM 2009/05). Supernova remnants - SNRs - are usually suspected to accelerate most of Galactic cosmic rays (CR) detected on Earth. The main issue is to determine the origin of the very high energy (VHE) gamma rays produced in these assumed CR acceleration sites. Photons may arise from leptonic processes such as Inverse Compton and bremsstrahlung radiation, or from hadronic interactions producing gamma rays via pion decay. The latter, directly tracing accelerated protons, provide valuable probes of CR acceleration in SNRs. In some cases a supernova occurs in a molecular cloud neighborhood. The presence of high gas density near the CR accelerator increases the targets for hadronic collisions, and hence the gamma-ray luminosity. The interaction between the dense cloud and the expanding supernova remnant can be directly detected through OH Masers at 1720 MHz (Lockett et al. 1999). G349.7+0.2 is a young SNR (∼ 2800 years old, Slane et al. 2002), located in the Galactic plane on the other side of the Milky Way (Fig. 1), at a distance of about 22 kpc (estimated via the velocity of the maser source, Frail et al. 1996); most SNR detected so far with H.E.S.S. have much smaller distances of a few kpc. Diffuse radio emission (Fig. 2) reveals the structure of the expanding ejecta (Brogan et al. 2000), whereas CO line emission traces the gas. The strong interaction between the expanding remnant and a ~10000 solar mass molecular cloud is revealed by OH maser emission. Chandra X-ray observations (top image) show a similar shell pattern as the radio continuum (Lacendic et al. 2000). Given its large distance, G349.7+0.2 is one of the brightest SNRs at these wavelengths. In the high-energy gamma-ray domain, the Fermi-LAT instrument detected GeV gamma ray emission toward the position of the SNR (Castro and Slane 2010). The H.E.S.S. instrument observed G349.7+0.2 between 2008 and 2009. Together with data taken on neighborhood objects such as the remnant RX J1713.7-3946 and during the Galactic scan, more than 110h of data were accumulated. The H.E.S.S. data (Fig. 3) show a ~6 sigma detection of G349.7+0.2, at a flux of roughtly 0.4% of the Crab flux, and a spectral steepening compared to the Fermi energy range. Given the unusually large distance to the remnant and hence its high gamma-ray luminosity, interaction of protons accelerated in the SNR with the cloud seems the most plausible explanation for the detected VHE gamma ray emission under consideration of the energy output from a typical SN explosion (~10^51 erg). Fig. 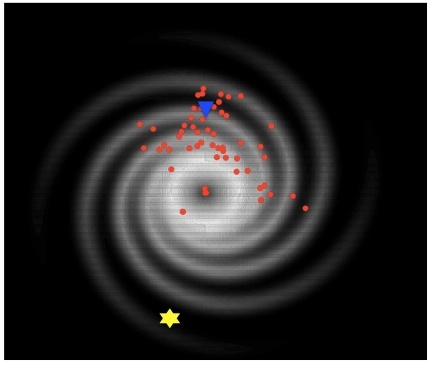 1: Illustration of the approximate location of G349.7+0.2 in the Galaxy (yellow star); the blue triangle indicates the location of the Solar System, the red dots the other very high energy gamma-ray sources. Fig. 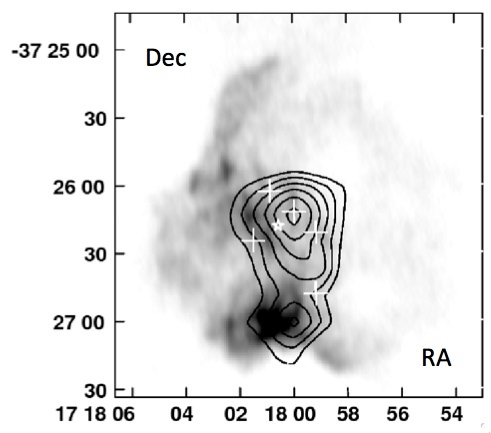 2: CO line radio emission tracing molecular gas (contours) superimposed on radio continuum emission showing the remnant shell (Brogan et al. 2000). Crosses show the location of OH maser emission. Fig. 3: H.E.S.S. very high energy gamma ray image of G349.7+0.2, on a different scale. The crosses once more show the location of OH maser emission, the green lines the 4/5/6 sigma significance coutours. The size of the gamma ray source is consistent with the angular resolution of H.E.S.S.